Some smart US builders are recognizing, like firefighters did a while ago, that urban infill podiums with wood framing on top are next to impossible to save and defend in a fire. When an arson throws a fire accelerant up and over a barrier fence, past guards and cameras the fire accelerated faster than any defense engagement could support. 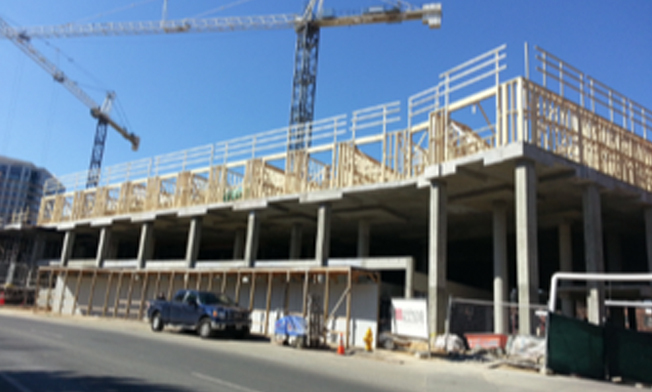 Builders cannot get permits unless they can provide parking which accomodates all the future occupants. The podium parking structures, are what make tall concrete podiums much harder for firefighters to get to and defend these wood-framed buildings under construction. By the time fire trucks and firefighters arrive at these podium sites, it's hard to climb the podium decks with hoses and water in a timely manner to offer any defense, or saving workers lives, as witnessed in Denver this past year. Our firefighters already know today’s lumber attacked by arsons on podiums is not something they can’t save, so they set out with boom cranes to save nearby buildings from burning down as well..
Last year in Oakland, permits were issued for more than 4,000 housing units — six times the annual average during the previous decade. There are more than 8,600 units under construction and 8,000 more going through the approval process. By 2024, Mayor Libby Schaaf wants Oakland to have built 17,000 new units of housing and protected 17,000 existing affordable units. The building boom has continued, despite rising construction costs and the shortage of labor now with pre-fab walls that create a new inventory fire risk. All kinds of new anti-arson proactive defense solutions like round-the-clock guards, dogs, cameras, lights, taller fences, sensor techs and fire-protection for lumber as developers are determined to build in cities like SF and Oakland to meet the demands for housing even under higher arson risk. All these anti arson defenses have some value only until a building is on fire because once the building has been attacked with fuel they have no value. Sensors that alert the Fire Department early helps the fire fighters save neighboring buildings where there is big litigation exposer but it does little to save the building itself.The only way to defend these wood structures sitting up on tall podiums from a total loss is to fire defend one hundred percent of the interior lumber. With Mighty Fire Breaker fire inhibitor sprayed on all the interior lumber as the building frames vertical interrupts the chemical reaction of the fire to stall and slow its ability to get to flashover faster than firefighters are out there to mop things up safely. The IRMI Gary Bird Award recognized one of those smart building teams that said enough is enough, we are building above the required code with the newest fire defense technology the industry has to offer. At M-Fire we are proud to be the defensive intel inside this Builders Fire Elimination Plan. Our Mighty Fire Breaker™ Applied Science and Technology(SM) Defends Wood Framed Buildings which lowers loss and make them safer for workers while also defending the carbon storage.